Preparing a sales meeting always starts with a written plan of topics to be discussed. Sales meetings typically cover a range of topics such as sales pipelines, performance statistics, industry trends and new opportunities. Documenting the topics is vital in tracking performance and progress, and becomes a factor when doing employee reviews for sales professionals. 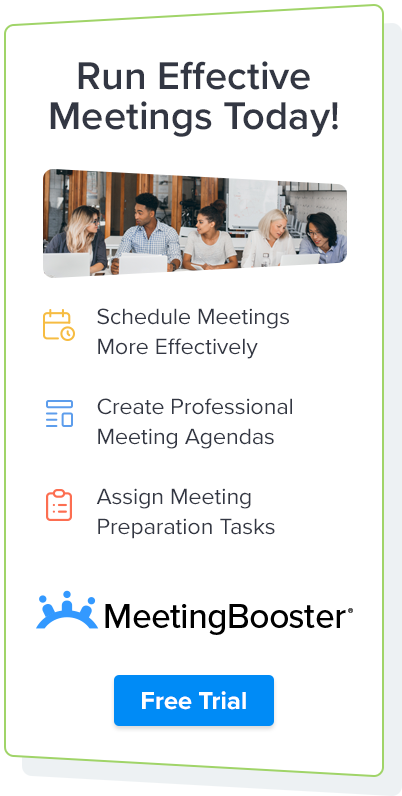 If you want to streamline sales meeting minutes, the use of meeting minutes software like MeetingBooster makes it easy, adds accountability, consistency, and increases overall effectiveness. If you are looking for a sales meeting minutes sample, you have likely found various examples from real life meetings, based on an agenda relating the company that created it. If you need a generic example, here is a sales meeting minutes sample made by MeetingBooster. Find sales meeting minutes here! The most common format of meeting minutes is Action minutes, though depending on the meeting type, you may need to adapt a different format of minutes, or even a combination of the 3. Action minutes - decisions reached and the actions to be taken, though not recording the discussion that went into making the decisions. Discussion minutes - contain everything action minutes do as well as the discussion which leads to the actions decided upon. Verbatim minutes - a record of every single word said at a meeting. Regardless of the format chosen, you will likely have Excel Spreadsheets, CRM Pipeline reports, and additional supporting material that will be discussed and possibly updated during the meeting. You will need to be sure to attach the updated version(s) of these files so that when the archived sales meeting minutes document is viewed, the user will be able to access the files. Content management systems like SharePoint are popular choices, however meeting minutes software like MeetingBooster allow you to attach and hyperlink to files directly through the meeting minutes. All attachments are automatically stored and archived for later review. Sign up for a free MeetingBooster webinar. When the meeting is adjourned, it is the note takers responsibility to review and finalize the minutes. It is important that the note taker match the minutes up to the agenda topics, and ensure that each topic has been addressed and documented. Traditional programs like MS Word are tedious, due to formatting, company letterheads, and the redundancy of the note taker having to re-type the captured information into a more formalized meeting minutes document. Meeting minutes software like MeetingBooster automates this process. Sales meeting minutes documents are created using professional layouts, capturing all important information and organized in an easy to review format. Users can distribute the minutes to attendees and teams with a few clicks and the documents are archived for future access and review. Why MeetingBooster is the best Sales Meeting Minutes software?